CLEAN AUTO CHECK / ACCIDENT FREE, ONE OWNER, UNDER FULL FACTORY LIMITED WARRANTY, Q7 PREMIUM PLUS PKG- NAVIGATION, BACK-UP CAMERA, BLUE-TOOTH, DEEP-TINT PANORAMIC SUNROOF, BOSE SOUND SYSTEM, WINDOW SHADES, FOUR ZONE CLIMATE CONTROL, 19 WHEEL PACKAGE WITH NEW TIRES., Steel Spare Wheel, Lip Spoiler, Perimeter/Approach Lights, Chrome Grille, LED Brakelights, Clearcoat Paint, Chrome Door Handles. This Audi Q7 has a powerful Intercooled Supercharger Premium Unleaded V-6 3.0 L/183 engine powering this Automatic transmission. *Experience a Fully-Loaded Audi Q7 3.0T Premium Plus *Window Grid Diversity Antenna, Wheels: 8.0J x 18 6-Spoke-Design, Wheels w/Silver Accents, Valet Function, Trunk/Hatch Auto-Latch, Transmission: 8-Speed Automatic w/Tiptronic -inc: Dynamic Shift Program w/additional sport program, Transmission w/Driver Selectable Mode and Oil Cooler, Towing Equipment -inc: Harness, Tires: P255/55R18 AS, Tailgate/Rear Door Lock Included w/Power Door Locks, Systems Monitor, Spare Tire Mobility Kit, SIDEGUARD Curtain 1st, 2nd And 3rd Row Airbags, Side Impact Beams, Roof Rack Rails Only, Roll-Up Cargo Cover, Remote Releases -Inc: Power Cargo Access and Power Fuel, Remote Keyless Entry w/Integrated Key Transmitter, 4 Door Curb/Courtesy, Illuminated Entry and Panic Button, Refrigerated/Cooled Box Located In The Glovebox, Driver / Passenger And Rear Door Bins and 1st Row Underseat Storage, Redundant Digital Speedometer. 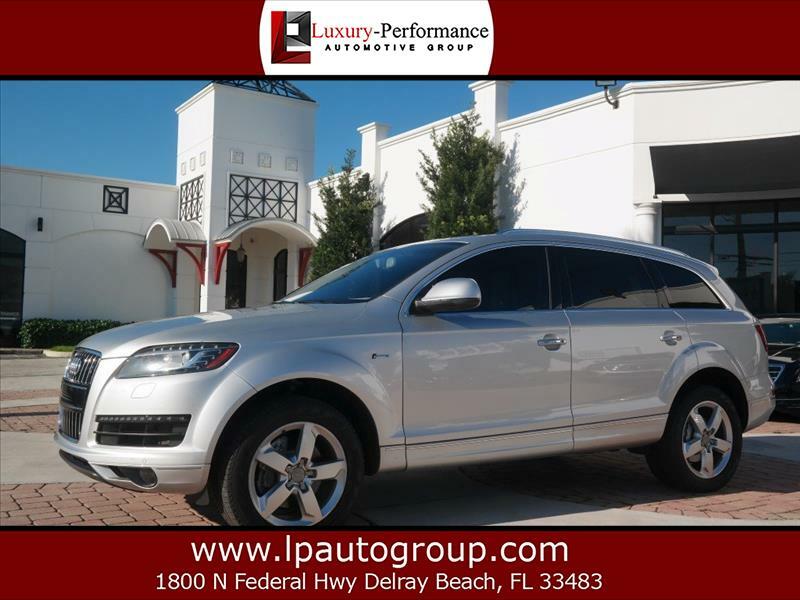 *Drive Your Audi Q7 3.0T Premium Plus With Confidence *Delray Mitsubishi & Luxury Performance Automotive Group graded the Overall Condition of this vehicle as Excellent. Clean, non-smoker interior! *Expert Reviews! *As reported by KBB.com: Audi loyalists will gravitate to the 2015 Q7 as their families outgrow their A4 or A6 sedans, and newcomers will be attracted by the good fuel economy, a proven safety record and standard all-wheel drive. *Visit Us Today *Test drive this must-see, must-drive, must-own beauty today at Delray Mitsubishi & Luxury Performance Automotive Group, 1800 N Federal Hwy, Delray Beach, FL 33483. Visit Luxury - Performance Automotive Group online at www.lpautomotivegroup.com to see more pictures of this vehicle or call us at 561-926-9599 today to schedule your test drive.